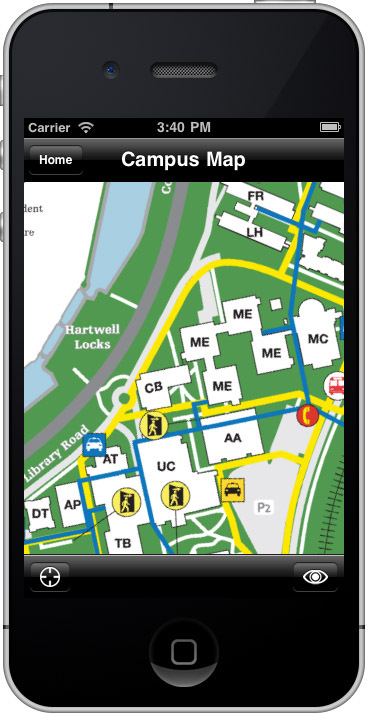 Campus maps are the second most valuable feature among our Mobilversity apps. This feature also simplifies your institution, as it makes your campus easier to navigate for prospective students, current students, and visitors. A study by Nielsen suggests that 51 percent of smartphone owners use maps, navigation, and search at least once a month “Play Before Work”. Using images of your campus in combination with Google Maps and GPS, students can access their classroom locations and get directions to other buildings on your campus. This feature is excellent for prospective students who are visiting your college. During a recruitment tour of campus, your tour guides can suggest that new students and parents track their route on the map as they go. This makes your campus easier to navigate and less intimidating! Combining course schedules with map locations is extremely beneficial to current students. Class schedules are very confusing during the first couple weeks of school as lectures are held in many different buildings and rooms at various times. To get through the first week of school, students often need printed schedules to navigate around campus. With Mobilversity, students can easily check their class location and time on their smartphone. The convenience of a mobile app gives them the time to find the classroom without needing to find a computer first. Ultimately, this ensures that their university experience is not negatively affected due to tardiness or absenteeism. Universities and schools receive hundreds of visitors each year. As many universities are rather large and sometimes complicated, having a GPS enabled map saves time and energy for your visitors. Ultimately, this means their experience will be the best it can be.